When I first wrote about Great Canadian Rebates, I promised readers who joined under my referral that they would have an opportunity to win a $25 gift certificate from Amazon/Chapters. As keeping with the promotion, we have drawn the newest winner.. Patricia from Toronto! Congrats! The next 100 sign ups will also be put into the draw for another $25 GC. Remember, not only is it free to join, they pay you $2 upon registration. You can check out my review of Great Canadian Rebates for more info. The great thing about the Canadian Tire GC is that they're treated like cash so you are given Canadian Tire Money. With the 5.25% Cash Back Rebate, you can save up to 12% on your purchase. Collect Canadian Tire money in car until you reach $5.00 or more. Go in an actual Canadian Tire store and ask one of the cashiers to kindly put all the CT Money onto an open value gift card "since it's annoying carrying around this thick wad of CT money". Use new gift card to purchase gas at CT gas bar (thereby using CT money to purchase GAS AND further maximizing your reward). My Dollar Plan gets into analyzing their energy use with pretty charts and graphs. Thicken My Wallet gives a primer of critical illness and disability insurance. The Digerati Life writes that in order to survive a recession, think long term. Lazy Man Gives us Five Cheap Date Ideas! Canadian Capitalist explains The Costs of Home Ownership. Brip Blap has a great article on how to make your 9-5 job a 10! Generation X Finance asks us if Generation X is responsible for the real estate and mortgage problems. Consumerism Commentary has a study showing the correlation between payday loans and bankruptcy. The Sun's Financial Diary created a poll and asked if we bought the Visa stock. The results seem to go 50/50 based on 53 voters. Money Smart Life warns us to Watch Out for these Tax Scams, Frauds and Schemes. FT: Thanks for the mention. Cheers! Thanks for the mention. 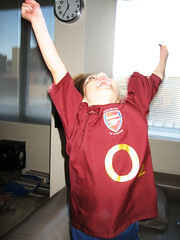 Good to see Arsenal on your blog! Just wanted to thank you for the introduction to Great Canadian Rebates. I was very surprised when they notified me that I had won the gift certificate. I chose the Amazon.ca certificate and received it the next day and have the credit in my Amazon account now. I always enjoy reading MDJ, keep up the good work. Some great weekend reading, thanks for sharing! How do you find out who you have referred to greatcanadianrebates.ca? I can find the number of people I have referred but no specific information on who they are. If you would like to check if someone you referred joined Great Canadian Rebates, please email their email address and we can confirm if they joined using your referral id.